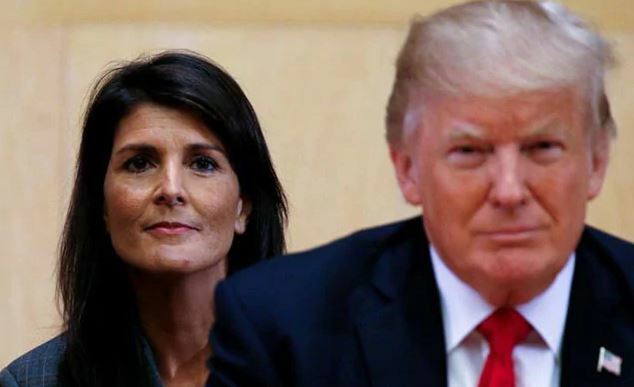 Washington: Describing Indian-American Nikki Haley as an ‘extraordinary person’, President Donald Trump has said the outgoing US ambassador to the UN is ‘going to make a lot of money’ in the private sector, which she intends to join. Haley, 46, the first Indian-American to hold a Cabinet-ranking position in any US presidential administration, tendered her resignation Tuesday, which Trump accepted. She had hinted in her resignation letter that she is headed to the private sector after two years at the UN and, before that, six years as South Carolina’s governor. She is likely to stay in the position till the year-end so that her successor could be nominated and confirmed by the Senate. Asked about the timing of Haley’s resignation, that too just before the mid-term polls, Trump said nothing much should be read into this. Trump said Haley spoke to him about it some six months ago. ‘She and I had spoken at least six months ago. Maybe even a year ago, we had conversations. She wanted to be here for about two years. I think the point really was, last week at the United Nations, she wanted to get through that and then go, probably into the private sector for a while,’ he said.